Fathers are always trying to get their daughters interested in their favorite past times, but often with limited success. 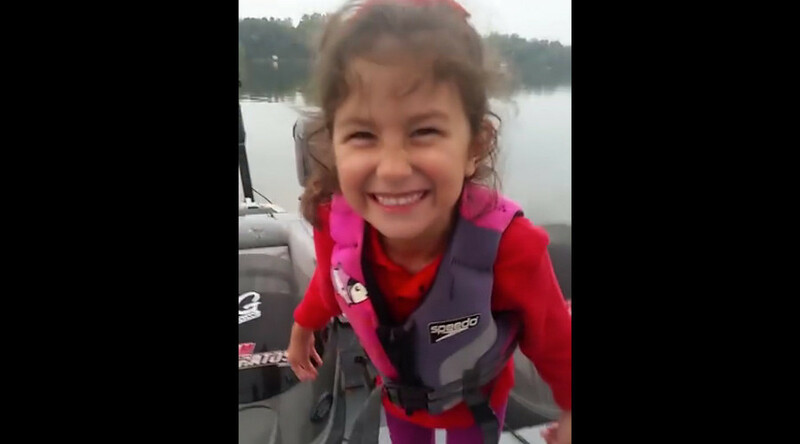 However, one dad had the thrill of a lifetime, as his five-year-old reeled in an enormous bass fish with her Barbie fishing rod. The girl called Avery was overwhelmed by the weight of the fish, and asked her father for a little assistance. However, he encouraged her to reel in the catch all on her own. “You keep going!” he said. “You got it, you keep reeling! Don’t drop it!” he added, while filming it on his camera. The girl finally hauled in the huge fish, which according to the excited dad, was 20 inches (50cm) long. They were both stunned upon seeing the size of the bass, which weighed around five pounds (2.2kg) and starting laughing and saying “Oh my Gosh!” in turn.